Associated Oral & Maxillofacial Surgeons has made dental implants a cornerstone of our practice. Each year, our doctors replace hundreds of damaged and missing teeth with natural-looking, durable restorations. We also use the treatment to improve the fit and function of dentures. Are specialists with years of practice in the procedure. Have resources that make the experience convenient, safe, and comfortable. Participate in ongoing skill development and leadership in implant techniques. As a patient, you will receive care from our specialists in oral surgery as well as your restorative dentist. The AOS implant center will coordinate your appointments so that you have both the best treatment and most convenient experience possible. A dental implant is a replacement tooth root. Positioned within the jaw and below the gum line, the implant connects to a single crown, a set of crowns, dentures, or a custom framework that supports a full arch of teeth. You are missing a tooth or several teeth. You have teeth that require extraction. Your dentures are not working well or fitting comfortably. You prefer a solution that is long-lasting, natural-looking, and fully functional. A dental implant is often more durable than other restorations because it rebuilds the tooth from the root up. Alternatives such as bridges rely on reshaping and connecting to adjacent teeth. This can diminish the strength of the teeth and lead to future dental treatments. As a result, dental implants may be more cost effective over the long term. The treatment also helps to conserve bone, which may otherwise erode and create a gap between the gums and the new tooth. As a result, dental implants promote a more natural and aesthetically appealing appearance. Many of the patients treated by AOS at our Peoria, Galesburg, and Macomb locations say that family and friends couldn’t tell the difference between the restoration and their natural teeth. The implant center at AOS manages the care patients from all over central Illinois who are treated at our Peoria, Galesburg, and Macomb locations, making treatment with dental implants simple and convenient. Start by scheduling an appointment with our practice. During your visit, your AOS doctor will assess the area of concern and evaluate your needs. For example, if you have lost a tooth recently and require a replacement, your treatment will differ from a patient who has had a missing tooth for a number of years and may have experienced bone loss. Our specialists in oral and maxillofacial procedures will plan and place your dental implants. Your restorative doctor will fabricate and attach the new teeth or dentures. The implant center will coordinate each visit and be your single best point of contact. Bone grafting to strengthen the implant sites. Placement of the dental implants. Whether and when you receive these treatments will depend on your needs. For example, some patients lack the bone tissue to support implants and require extensive grafts that will need time to heal. However, in many cases, AOS doctors can extract teeth, add grafts, and place dental implants in a single visit. The majority of these procedures can be performed at our Peoria, Galesburg, and Macomb locations. Before you receive dental implants, AOS will use 3D modeling to plan their placement. Your doctor will duplicate the model’s position, depth, and other features in the surgery. This precision leads to longer-lasting, more natural-looking outcomes. You will receive safe and monitored anesthesia. Our surgeons are skilled in multiple anesthetic protocols and will keep you comfortable throughout your treatment. Anesthesia services are offered at our Peoria, Galesburg, and Macomb facilities. Your doctor can replace as few or as many teeth as necessary. Even patients who are restoring the entire arch of teeth may only require 4-6 implants (“All-on-4®“). You’ll never have to go without teeth. 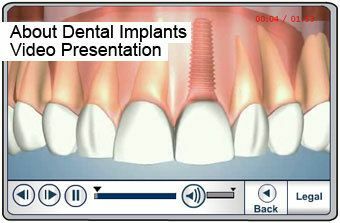 Your doctor will attach a healing cap or a temporary set of teeth to the dental implants. Expect to return to our practice at two weeks and again about 10 weeks after your procedure. At the final appointment, your AOS doctor often will obtain a digital impression for the restorative doctor. This will give your dentist everything necessary to create your new teeth. When these restorations are ready, your restorative doctor will connect them to the dental implants, completing the treatment. If your dentures do not fit comfortably, strategically placed dental implants can create a better connection between them and your gums and eliminate the need for denture adhesives. You may require bone grafting to add strength and stability to the area receiving implants. In the upper arch, your doctor will place four or more implants. In the lower arch, you will receive two or more dental implants. Patients typically choose either snap-on adapters that retain the dentures or milled bars that add stability and strength to the denture. The process and treatment schedule are similar to those of standard dental implants. You’ll return for follow-up visits to our Peoria, Galesburg, or Macomb offices, which our implant center will help you schedule. Our office will also coordinate with your restorative doctor in the creation of your new dentures, which he or she will attach in your final appointment. As a result of the procedure, you can expect a more stable bite, better fit, and more natural-looking smile. If you have missing or damaged teeth or dentures that don’t feel comfortable in your mouth, schedule a consultation for dental implants. Contact our offices in Peoria, Galesburg, and Macomb today. 929 W Carl Sandburg Dr.
By checking this box you hereby agree to hold Associated Oral & Maxillofacial Surgeons, including its doctors and affiliates, harmless from any hacking or any other unauthorized use of your personal information by outside parties. By checking this box, you also agree to receive email communication from Associated Oral & Maxillofacial Surgeons.